You will enjoy a morning yoga class and breakfast at the hotel. Proceed for your city tour visiting Mehrangarh Fort, the most magnificent fort in Jodhpur is the Mehrangarh Fort. It is situated on a 150-meter high hill. Rao Jodha, the then chief of Rathore clan, constructed it in 1459. There are a number of attractions within the fort like several palaces, galleries, a museum, and temples. Jaswant Thada - Jaswant Thada lies to the left of the Mehrangarh fort complex. It is a royal cenotaph made up of white marble. It was built to commemorate Maharaja Jaswant Singh. Some rare portraits of the former rulers of Jodhpur are also displayed here. In the afternoon, enjoy a Jeep Safari to Bishnoi villages. You will stay the night in a comfortable hotel in Jodhpur. You will enjoy a morning yoga class and breakfast at the hotel. After, the group starts the drive towards Udaipur en-route visiting the famous Jain Temples at Ranakpur. Udaipur is a beautiful city, set amidst the Aravalli Ranges of Rajasthan, India. Udaipur is known for its picturesque lakes, also referred as "The city of lakes". The elevated hills and the beautiful lakes make a picture-perfect backdrop to the Udaipur city. You will stay the night in a comfortable hotel in Udaipur. The ride will take approximately five to six hours and 290 kilometers. You will enjoy a morning yoga class and breakfast at the hotel. Later, proceed for a full day guided tour of at Udaipur, beginning with the visit to Saheliyon Ki Bari, the "The garden of maids”. Then visit The City Palace Complex, overlooking Lake Pichola, reveals the splendor with which maharajas and their families surrounded themselves. The City Palace Museum exhibits a remarkable collection of ancient curios, antiques, and sculptures, as well as priceless possessions of ages gone by. Miniature paintings on display depict many aspects of the royal lifestyle enjoyed by privileged few who lived here. Up next is a visit to the magnificent Jagdish Mandir, the largest temple in Udaipur, adorned with bas-reliefs of elephants, alligators, horsemen, and musicians; and enshrining a black stone image of the supreme Hindu god Vishnu. Followed by a boat ride on picturesque Lake Pichola reveals some of the spectacular palaces of the Rajput princes, for which Udaipur is famous, on islands and along the shore. In the evening enjoy a visit to an Indian home for a cooking demonstration and dinner. You will stay the night in a comfortable hotel in Udaipur. You will enjoy a morning yoga class and breakfast at the hotel. Check out and drive to Pushkar, a holy city of Rajasthan. 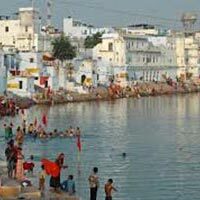 It is also famous for its yearly Pushkar cattle fair. In the afternoon, visit the Brahma Temple, the one and only temple in the world dedicated to him. Later, you will go for and overnight camel safari in Pushkar. The ride will take approximately five to six hours and 290 kilometers. Late checkout and on-time transfer to airport or further destinations.